Grease pit or fast food heaven? Atlanta institution or eye sore? 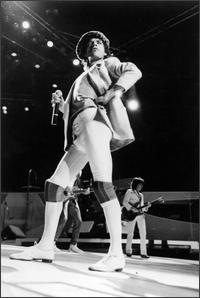 Classically decorated or more dated than Mick Jagger in hot pants? The Varsity, or more simplistically: The V, seems to be that type of place. In my 20+ years as an Atlanta denizen, people seem to find it a rather polarizing establishment. I am always surprised by the amount of vitriol thrown in the general direction of The Varsity. 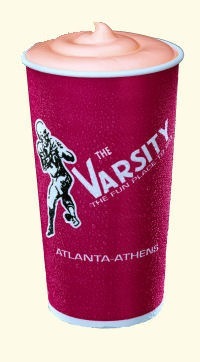 The V is perhaps the institution of all Atlanta institutions; while the staff has become watered down in recent years, the good still vastly outweighs the bad. This is the quintessential example of a restaurant where the food takes a back seat to everything else. Service hiccups notwithstanding, I enjoy several menu items and find the Varsity worthy of an occasional visit. Frank Gordy built the original Varsity in 1928. Since then, they have added five additional locations, a catering business, and one heck of a reputation! Since its inception, the V has made it a point to give people a different experience than is available anywhere else. Some 80+ years later, the V is as regarded for their vernacular and dialect as they are known for anything else. With the exception of the iconic “What’ll ya have,” I find much of this charm has gone by the wayside. I myself am quite skilled with their jargon but have all but abandoned it in recent years. This leads me to the single most glaring shortcoming of the Varsity: The register folk. While the car hops are as chipper as ever (though I only see them in passing now), and the bussers are still as sweet as apple pie … those who loom behind the counter seem to be a mixed bag. Maybe this is just a sign of the post-adolescent cynicism in me; maybe it’s just the perspective of experience; but, something is different. Even as a teen, I remember the overtly warm nature of nearly every order slinger in the place. Now, the front lines are awash with apathetic attitudes, unfriendly scowls that lack the charm of Ms. Ann, and gruff personalities that have made some kids cry! Ten years ago, you’d be hard pressed to run into one of these misanthropes. Today, I’ll give you just a 60:40 chance of ending up with one of the friendlier folk. That’s a bummer! Making their rounds outside, the car hops have been a part of the Varsity since the beginning. I remember coming here as a child on Sunday afternoons, pulling up to the car port, and watching my pops dish our order to Erby Walker and the like. 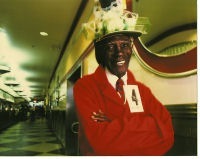 While Flossy Mae [the most famous of the car hops – pictured above] and Erby may be gone, the car hops are alive and well. To be honest, it’s been a few years since I had them serve me. I am not sure if any of them still sing; but, I would not be surprised if they do. As I walk by them on my way in, I see the cheerfulness that escapes so many of their interior counterparts. You should take advantage of this service during one of your first few visits. Regardless of your path of infiltration [off the top of my head, there are at least five], one thing will strike you soon after entering: this place is huge. Then again, you’ll probably pick up on that fact as you enter the parking lot as the Varsity covers two city blocks. Speaking of which, I am fairly sure this location was the largest fast food joint in the world until the Moscow McDs showed up. I may be wrong about that; however, the V still stakes its claim as the world’s largest drive-in. The interior of this place speaks a bit to my opening statement. On the one hand, things here are distinctly old school. The color scheme, the tables & chairs, and the artwork is as kitsch as it gets. At the same time, flat screen TV’s adorn a number of the rooms, high tech registers report your order back to you, and a multitude of new items have weaseled their way onto the menu. That leaves me a bit befuddled, I’d rather they just pick a side and stuck with it! The mish-mash of old and new, while unsettling, factors little in my opinion of this place. Ah, but the food … finally we have arrived. Is it as good as it used to be? Probably not! In the wake of the health craze, gone is the good old fashioned grease. Instead, we are left with us canola oil. The health conscious push has ruined that for us. Why would anyone trying to be the least bit healthy go to the Varsity? Good freaking question! All that aside, I find a handful of items as strong as ever. My standard order is, has been, and always will be, a chicken salad sandwich – hold the rags (aka the bag of chips), a heavy weight with cheese – sideways (hot dog with extra chili, chopped onions on the side), a ring one (a single order of onion rings), and a medium FO (Frosted Orange). As this is a place for gluttony, there are times when I will add to this order; however, these elements are a universal consistency for me. The chicken salad sandwich has become hit or miss. Sometime since my childhood, they started adding lettuce and tomato to the sandwich. I have no idea when or why … only that you have to ask for them to leave it off. What a pain! The mix should be served between two hot pieces of toast. While the flavor components are still there, the temperature/crispness of the bread is a crapshoot. The boiled chicken, mayonnaise, celery, and pepper hit the spot for me. The chili dogs here are still amongst my favorite in the city. They aren’t the highest in quality or in artistry, but their chili and cheese fuse with the meat and bun in the most harmonious of ways. The awkwardness of having to find a way to get the onions to stay in place is always a fun little exercise; meanwhile, the pop of the hot dog casing releases a familiar and unique flavor. Simple and straight forward, just what I want from a place like this. The rings capture my attention every time. While people can be as fussy over onion rings as they can about anything else, I find the version at the V to be spot on. The batter has a flakey characteristic that reminds me of tempura. Meanwhile, it has that intense texture and flavor that speaks exactly to what it is: deep fried goodness. Heavy on the grease, massive on the crunch, sweet on the palate – these do it for me. Add mustard and I’m good to go! The FO is just a giant, shake like version of a Push-Pop meets Orange creamsicle! It remains unchanged and for that I am eternally grateful! Over the years, I’ve had many other traditional items. If I’m doing a burger … I go glorified with pimento. As you may have guessed, my love of the burgers has waned significantly in recent years. They just don’t rock my world like a good ol’ Krystal burger does (or a high class burger at H&F). The fries have suffered a similar fate. As my father is my most frequent dining buddy here – I usually have the opportunity to grab some fries. If they were crispier, I’d like them more. The flavor is still really solid. The V delivers a thick cut tater that successfully incorporates a hint of the the flavor found in the potato skin. So while you won’t find Wagyu beef in their burgers, or any fancy shmancy hot dogs … the quality of their goods is pretty decent for the market they find themselves in. Sure things have changed over the years, and few of those things are for the better … but the Varsity still maintains its charm. 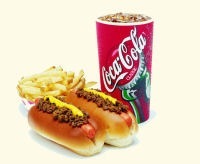 In the world of fast food … the experience reigns supreme. The quality of the food stacks up quite well against their challengers. If you go here expecting a gourmet experience … your palate will laugh and mocking you. However, if you go here for the experience and the handful of items on the menu that are pretty darn yummy … you’ll be as pleased as punch! Don’t forget to grab on of their famous hats (they are free) and enjoy the love that is this glorified heart attack. If you have stayed with me throughout this post, here is your reward: people almost always gravitate toward the lines closer to the interior of the building (where there is a lot of room). If that is the case when you show up, try to hit up the lanes at the south end of the building (closer to North Ave). They are always shorter and seem quicker as well. Stay tuned for the follow up post which will help you with the intimidating task of placing your order.